Where is home? That simple yet paramount question lay at the center of what would ultimately become one of the most significant changes Toyota’s North American operations had made in the past 50 years. 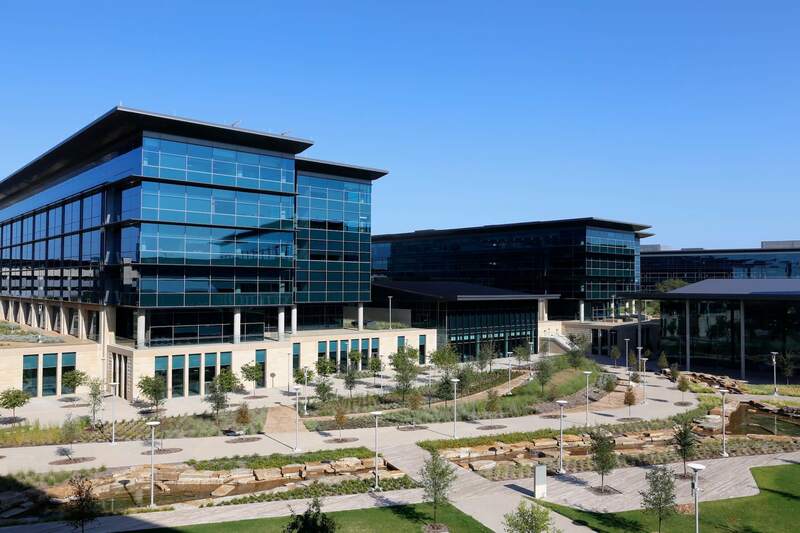 In 2014, Toyota announced the momentous relocation of its North American headquarters to Plano, Texas. 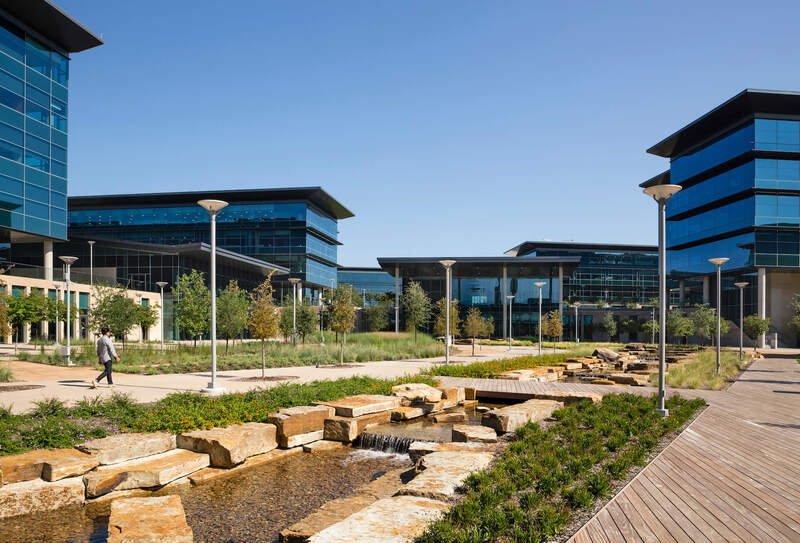 Throughout the process of choosing a new location and design partner, the concept of home weighed heavily on their decision, as Toyota would need to relocate thousands of people from across the country to Texas. 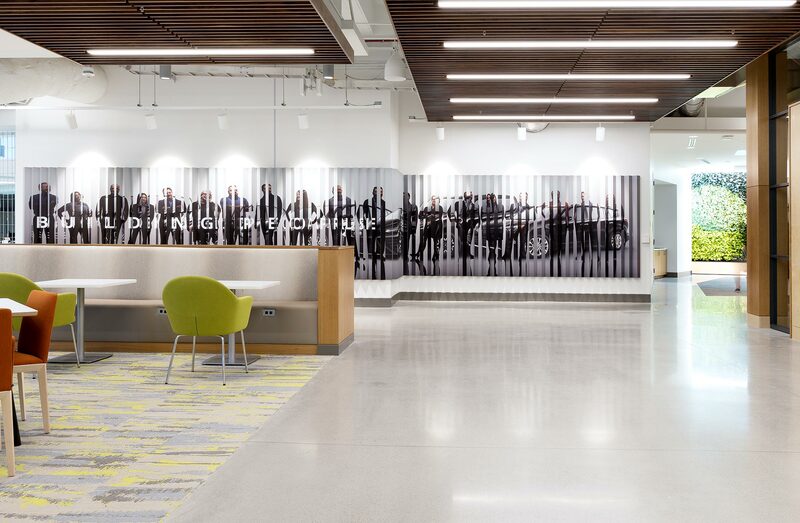 We knew we could create a beautiful, state-of-the-art space that could ultimately house nearly 7,000 Team Members in a light-filled and collaborative environment that fulfilled their every need. 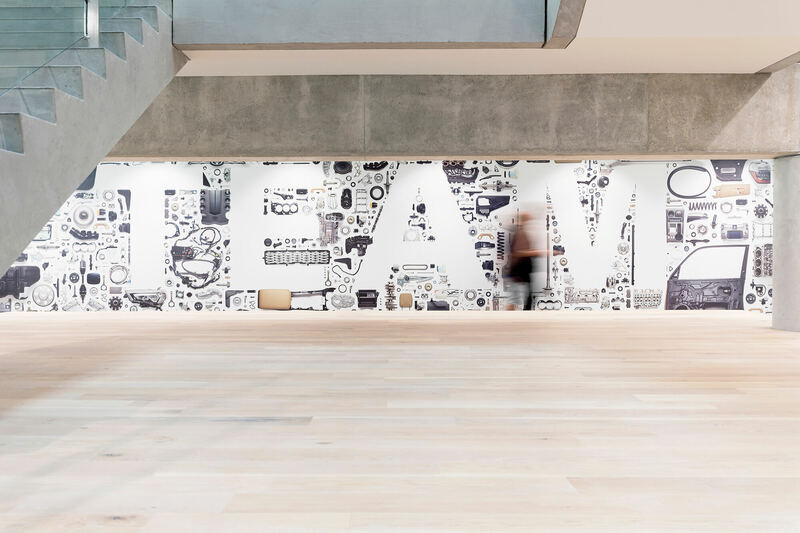 But we also knew that in order for such a significant change to be a success, Toyota’s Team Members needed to feel at home in their new space. And a physical space alone doesn’t make a home. Home isn’t just a building. Home is a feeling. 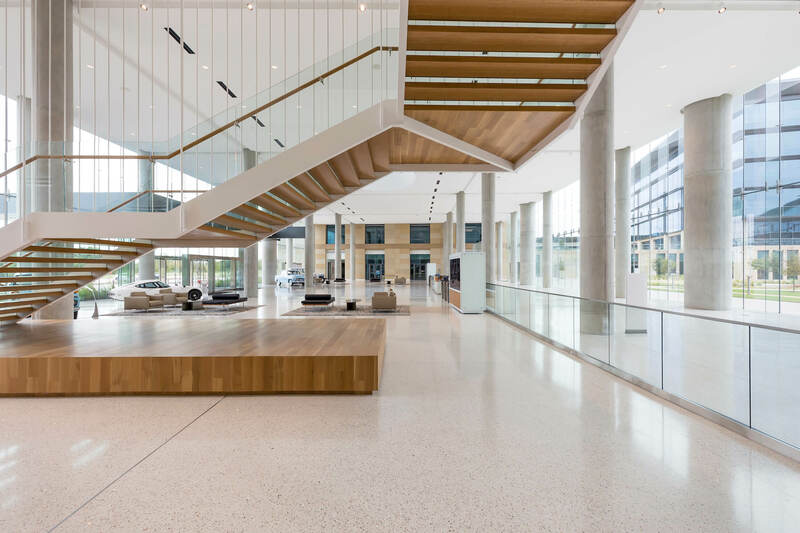 Here, we’ll show you how we helped Toyota North America find their home in their flagship North American headquarters in Plano, Texas. It’s impossible to imagine any other structure existing where Toyota’s North American headquarters now stands. 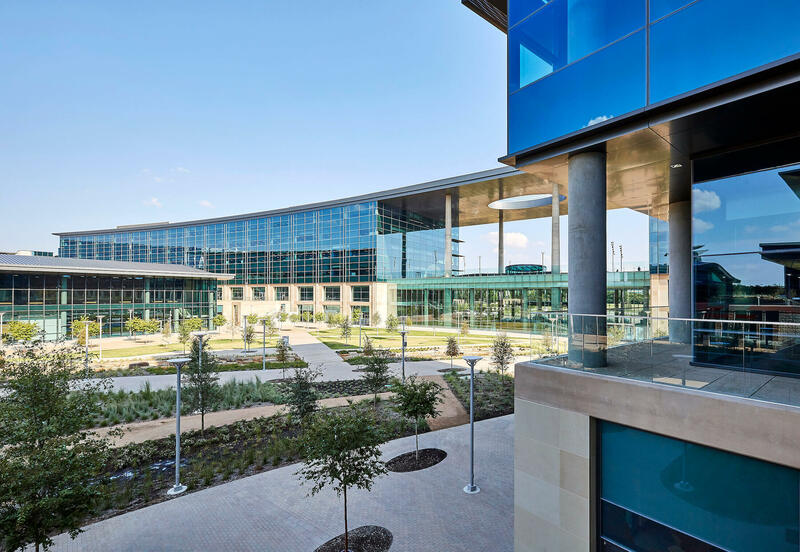 Though the 2.1 million square foot, seven-building, state-of-the-art campus sits on a patch of land that was completely empty only three years ago, the buildings look and feel as if they’ve always been there. 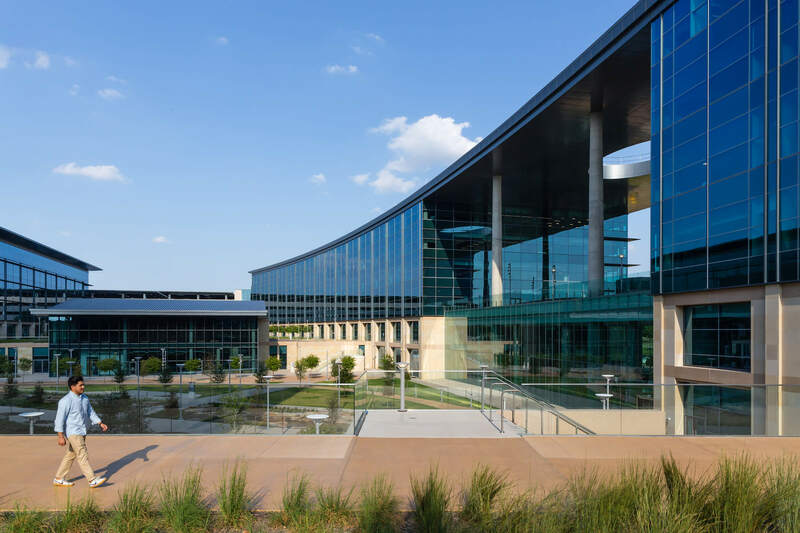 “The headquarters wanted to be both impressive yet transparent,” says Chuck Armstrong, who served as the design director on the project. 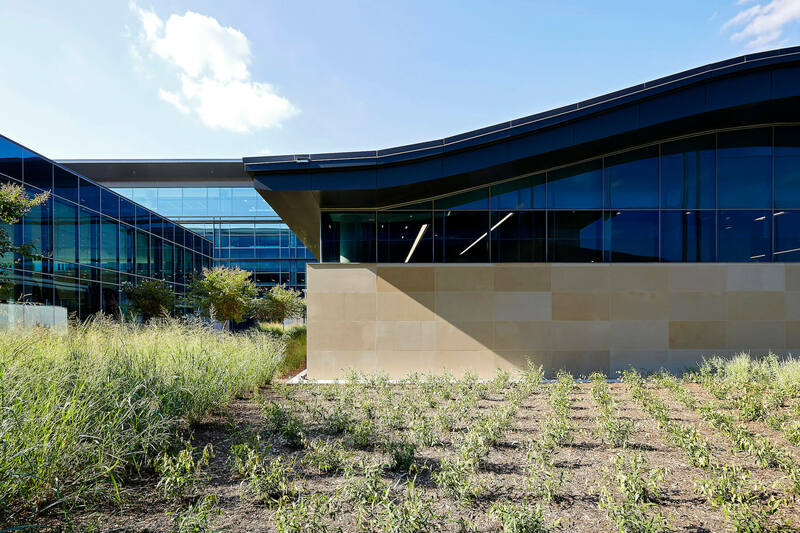 Designed to gracefully coexist with the natural environment, the entire headquarters carries a profound sense of belonging and peace with nature. The design encourages indoor/outdoor connections with office buildings and garden terraces that sit next to a large central court that serves as the heart of the campus. 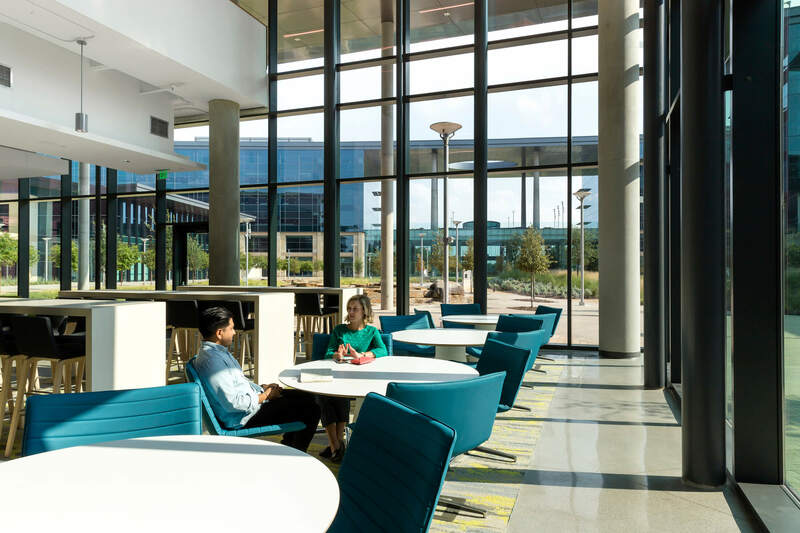 Featuring fixed benches, moveable café tables and chairs, and canopy trees that provide an abundance of shade, the central courtyard strikes a balance of natural serenity, quiet energy and focus. It also welcomes Team Members to crisscross it as they move around the campus or stop, flip open their laptop and work for a while next to the stream. 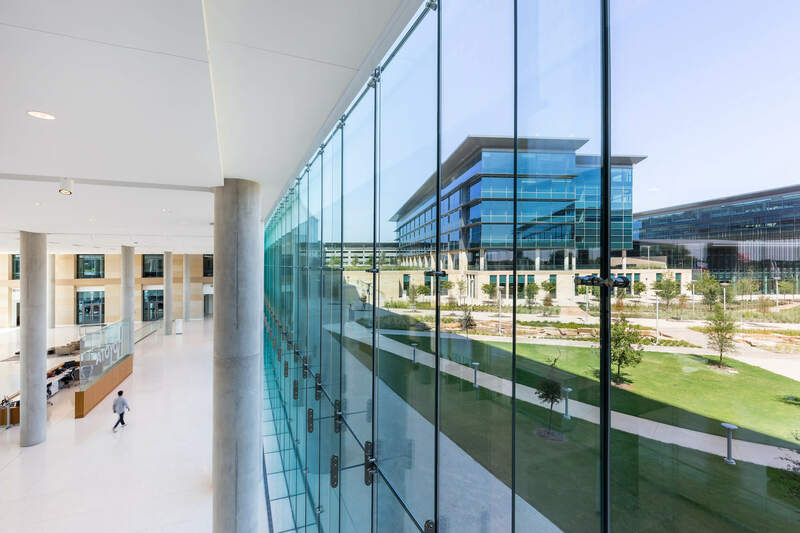 Twelve acres of glass provide an abundance of natural light and visibility across the 100-acre campus. In fact, 82% of people occupied spaces are provided with natural daylight illumination. In keeping with Toyota’s commitment to making a new home that would last, longevity was a central theme of our design process. “Our charge from Akio Toyoda was to create a place that would last for the next 50 years. We used durable regional glass, metals and stone as a response in a simple and timeless design expression,” says Chuck Armstrong. 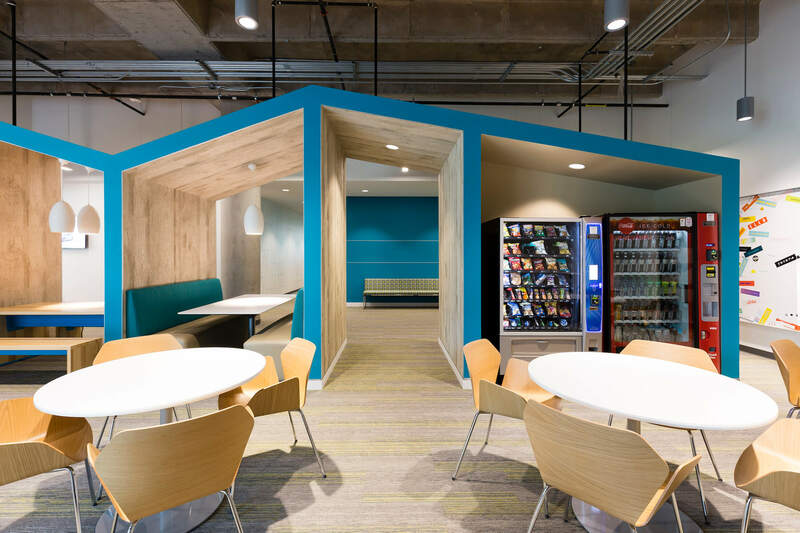 Deeply rooted in a culture of respect for the environment, Toyota’s passion for sustainability inspired our design team to create a space that would allow the company to grow and change with its immediate surroundings for decades to come. 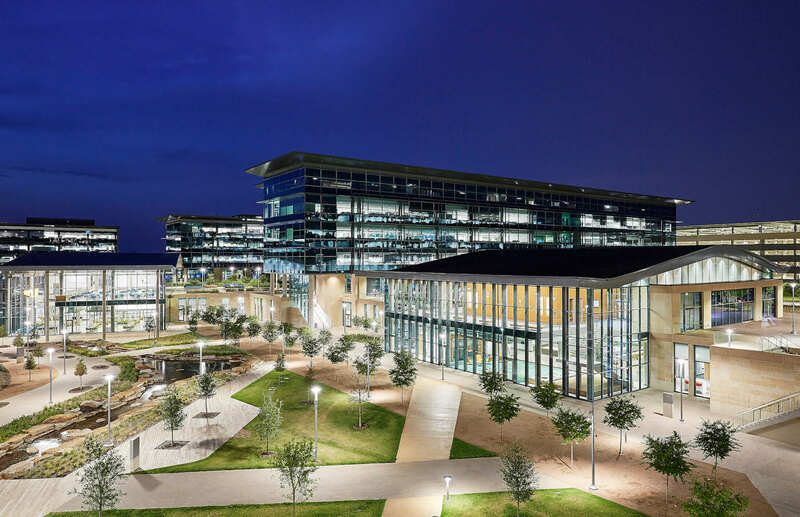 The Toyota headquarters is one of the largest LEED Platinum certified structures in the world. Through its use of sustainable materials and a sophisticated recycling and conservation system, the building gives back to the environment. 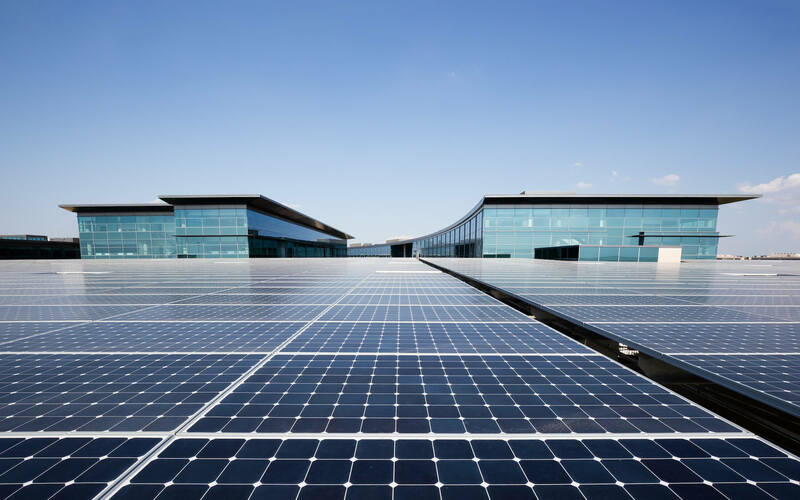 A sophisticated array of photovoltaic solar panels generates electricity from the sunlight, powering roughly 30 percent of the building’s energy needs. 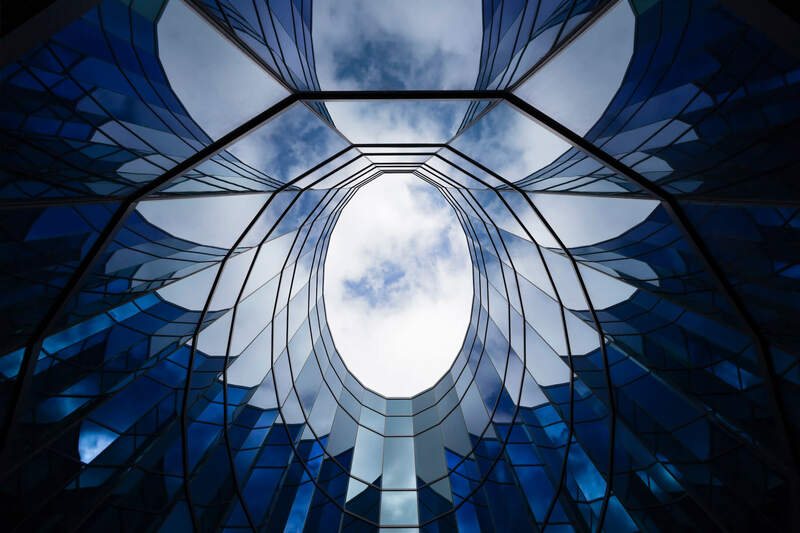 A rainwater management system, capable of recycling and re-using up to 400,000 gallons of water, lies hidden inside of the campus parking structures. 1,220 tons of Texas limestone (340 Texas-built Tundras) were utilized! 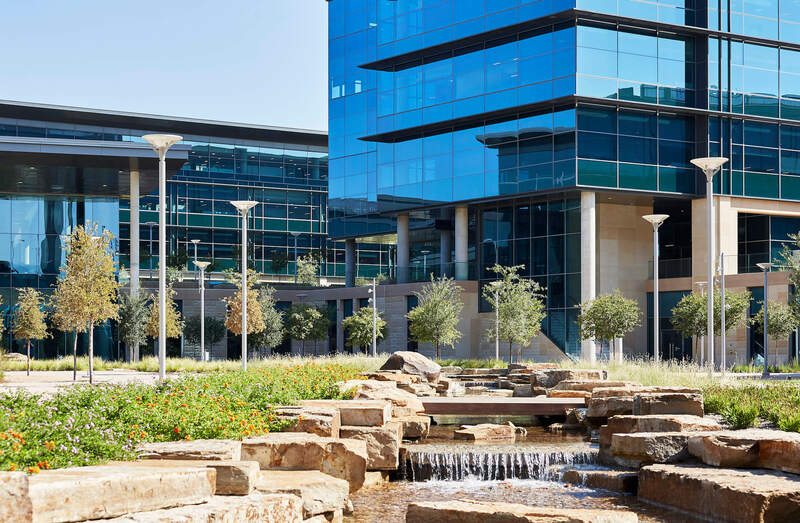 Eighty-four saved or relocated trees sprinkled throughout the Toyota campus and native landscaping utilized. Bringing everyone together under one roof wasn’t enough. 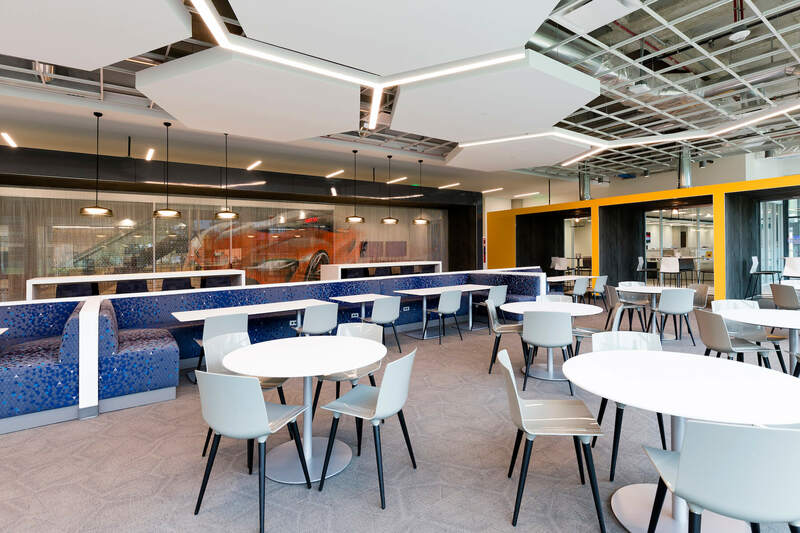 In order to realize Toyota’s future vision for a connected workforce, its new space needed to accomplish much more than physically bringing people together in one place. It needed to encourage Toyota’s Team Members to truly connect with each other in ways they never had before. 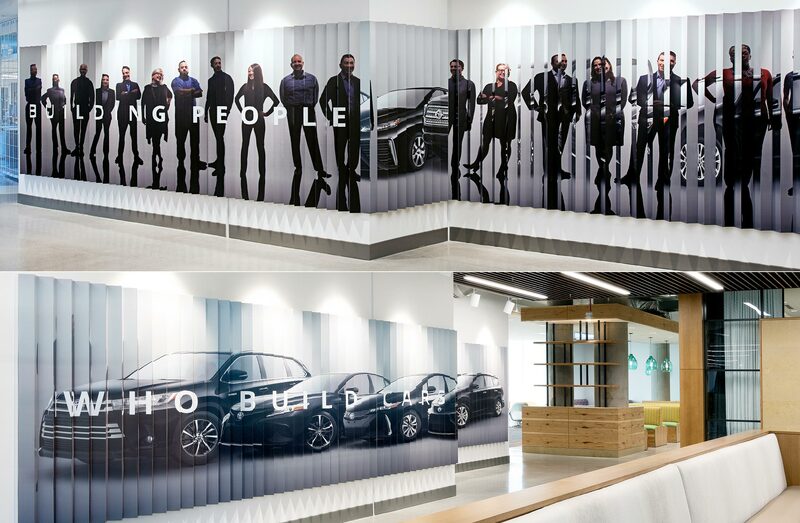 Introduced at the same time as the 2014 relocation announcement, the company’s “One Toyota” cultural priorities were developed so that all Toyota team members – from manufacturing, sales and marketing, corporate operations and finance – could finally be united in the way they work and collaborate. 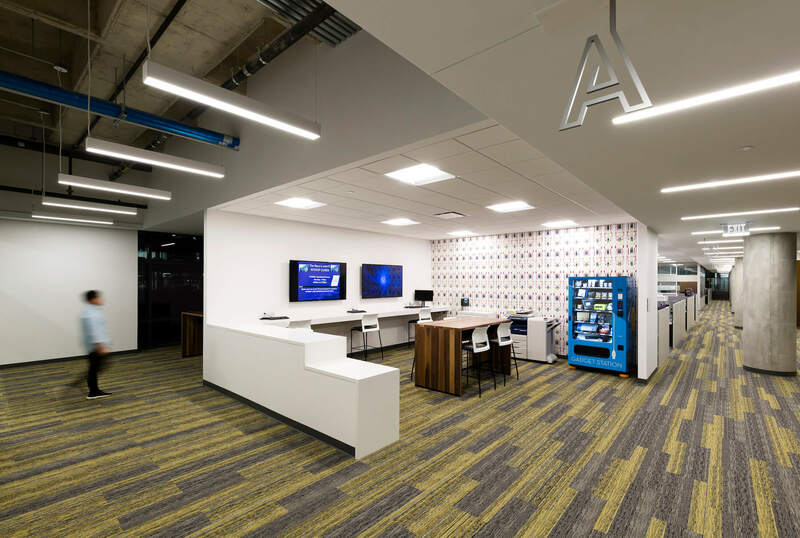 According to Toyota, working together in an open and connected space will allow easier and more frequent interaction and information sharing, as well as help push the company forward with swift, innovative decision-making. 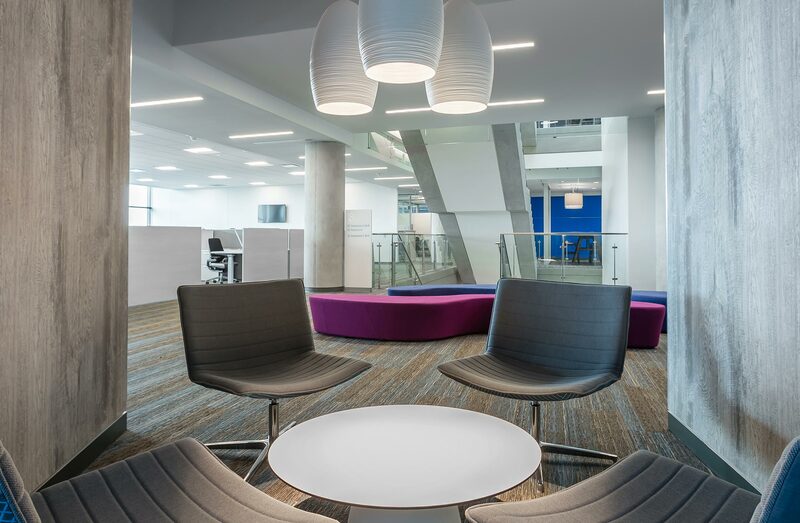 To enable a high level of interaction and ease, the campus features a 50/50 ratio of owned workspace to shared work areas. Put into perspective, their previous space had only 10 percent of space dedicated to common areas. 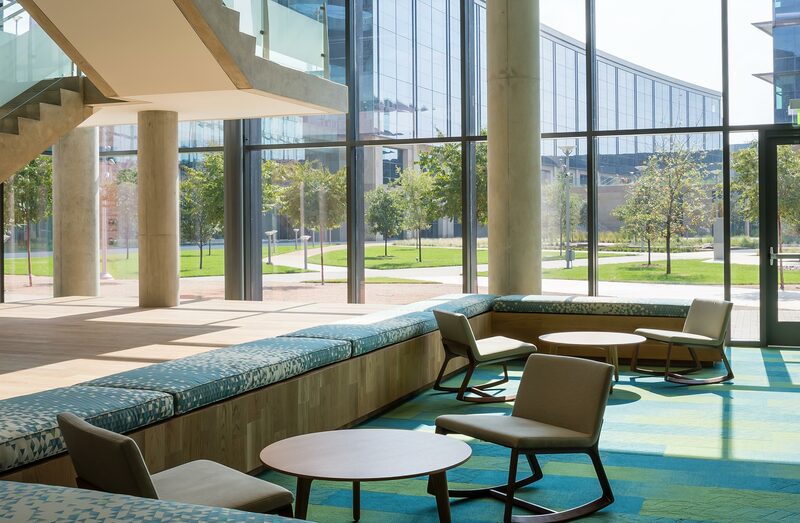 Half of the campus features unique spaces for collaborative, team-based work, social interaction and amenities or wellbeing, while the other half is dedicated to individual workspace and personalized departmental support spaces. 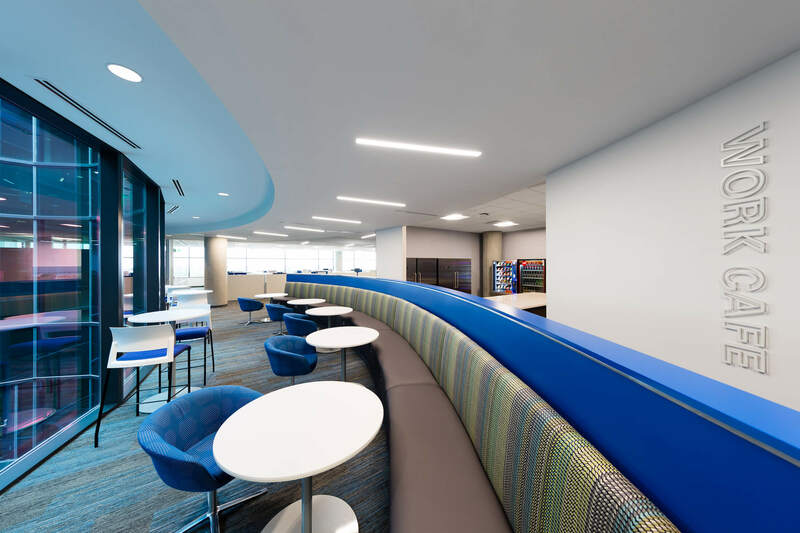 Utilizing a variety of different furniture solutions, we created a variety of flexible spaces for Toyota employees to focus, collaborate, or socialize. 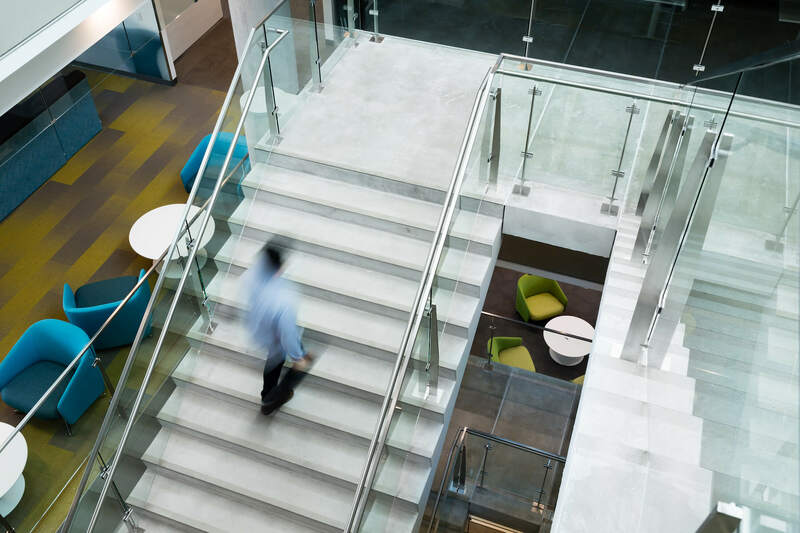 Oversized open centralized stairs with overhead natural lighting area features utilized throughout the office areas to activate spaces and to encourage wellness. Thoughtful placemaking appears in all of the work areas, so people can choose the appropriate space for the work they need to do. 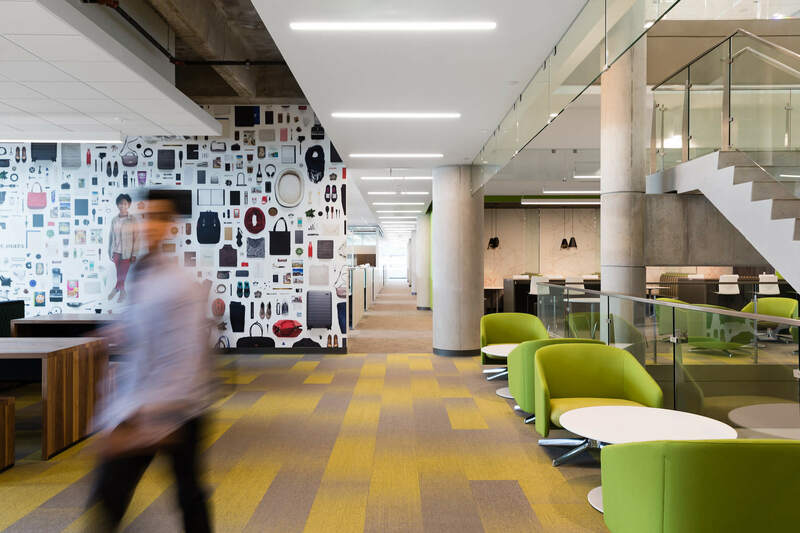 Across the massive office floors, natural resting spaces break up the monotony of the work stations and create “home away from home” areas that people can pop into. The entire campus creates a sense of ease and encourages interaction, a critical goal identified for the design team to address. 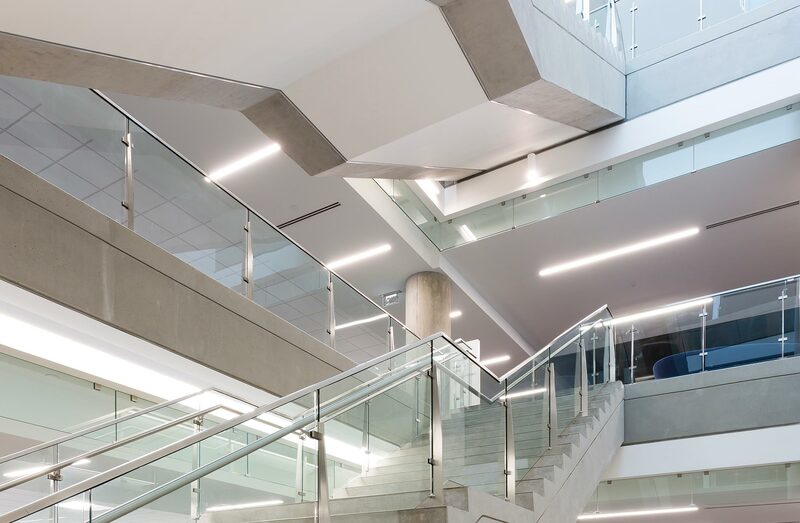 The layout of the seven buildings around the central courtyard – connected by a wide, light filled concourse and peppered with open stairways – naturally draws you inward. Exterior landscaping features drought-tolerant, North Texas indigenous plants like savannah, oaklands and wildflower meadows. Plants were selected to improve bio-habitat micro-climate, to promote improved pollination, and to provide additional environments for butterfly migration. The rooftop design, and low absorptive products used throughout the campus roofing, helps manage rainwater, reduces heat and insulates the buildings. For Toyota, moving in is about moving forward. As the automotive industry evolves beyond manufacturing cars and trucks, Toyota has broadened its identity from an automaker to a mobility company. 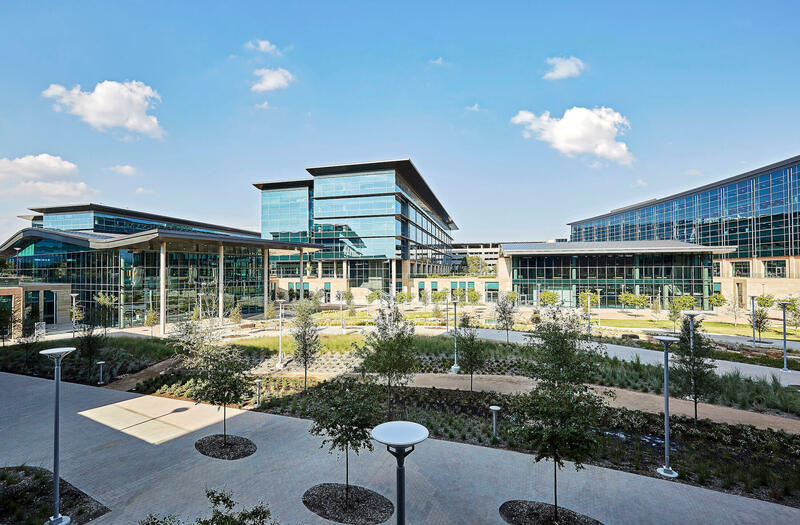 In order to maintain the feeling of speed and innovation needed for future success, Toyota knew that its new headquarters needed to have a pulse of its own. 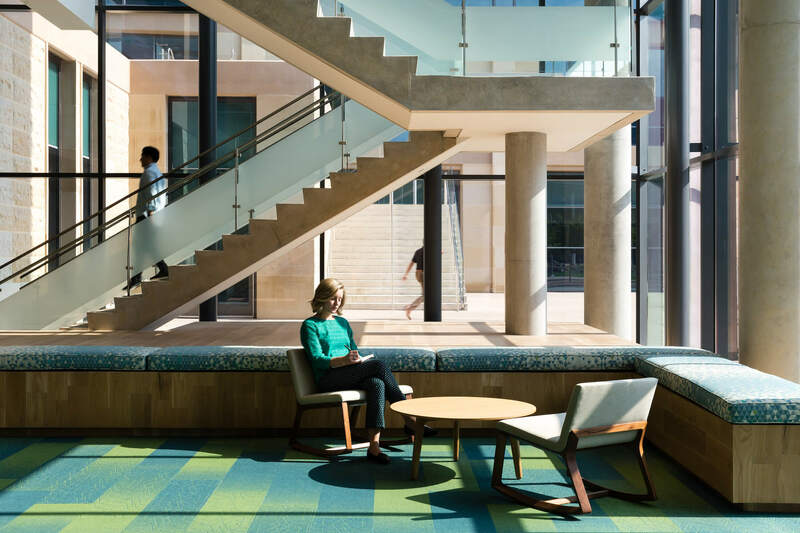 Navigating through the headquarters, one experiences a natural desire not only to move forward, but also up, down, inside, outside and all around the campus. Interior spaces incorporate improved light quality through a balanced combination of natural illumination and LED lighting. 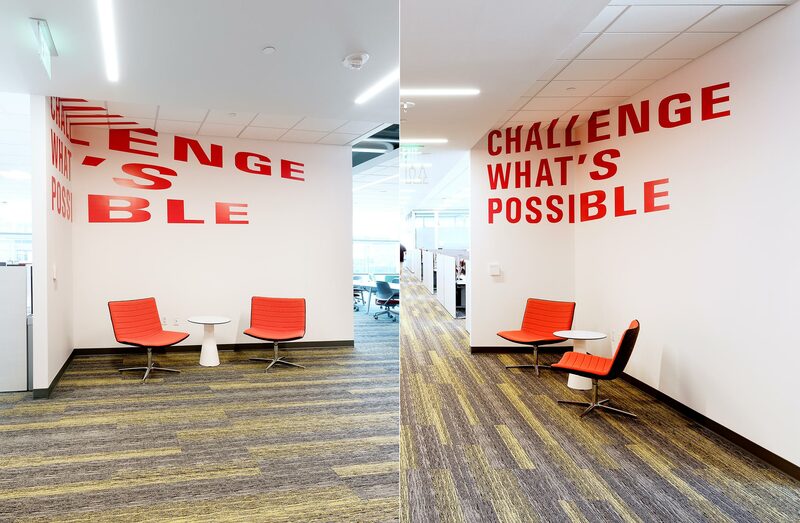 Rather than building a space to fit the company culture, Toyota designed a campus to create a culture – one that advances their goals for unity and connectedness. “We don’t desire to go anywhere that we cannot see,” says Corgan interiors leader Lindsay Wilson. 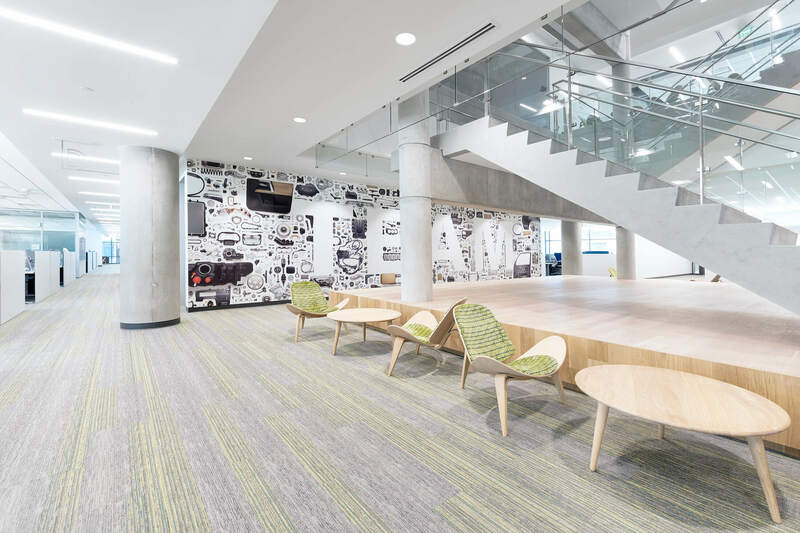 It was important to challenge “old ways of thinking” as part of the overall design process to ensure the workspaces still supported departmental needs while also reflecting the new company culture at the core of their One Toyota concept. The campus includes 7 individual office buildings and 32 individual floors. 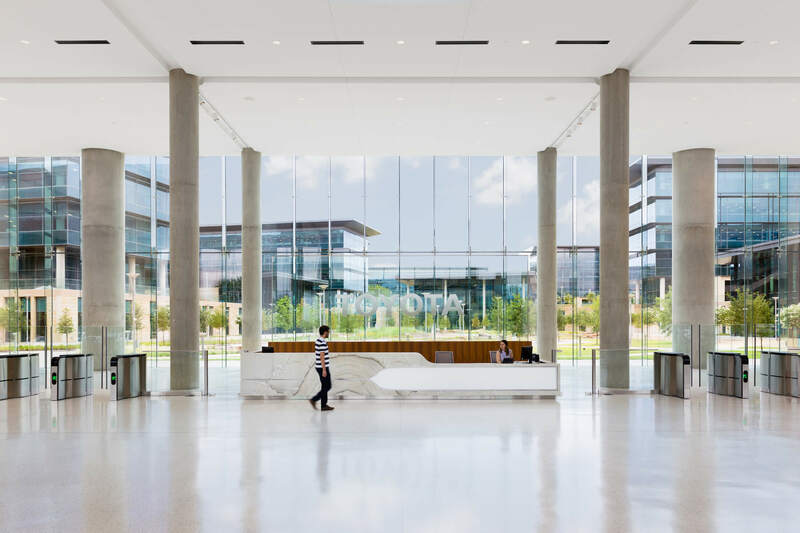 Toyota made an investment in bringing teams together to the new headquarters location and wanted to build a striking and inspiring new campus in effort to become a more cohesive, collaborative and innovative company. Openness and visibility were central to creating a feeling and desire for movement. The strategy of arranging buildings with common functions is to facilitate casual encounters with people from other departments – the layout encourages people to move about and engage with each other. 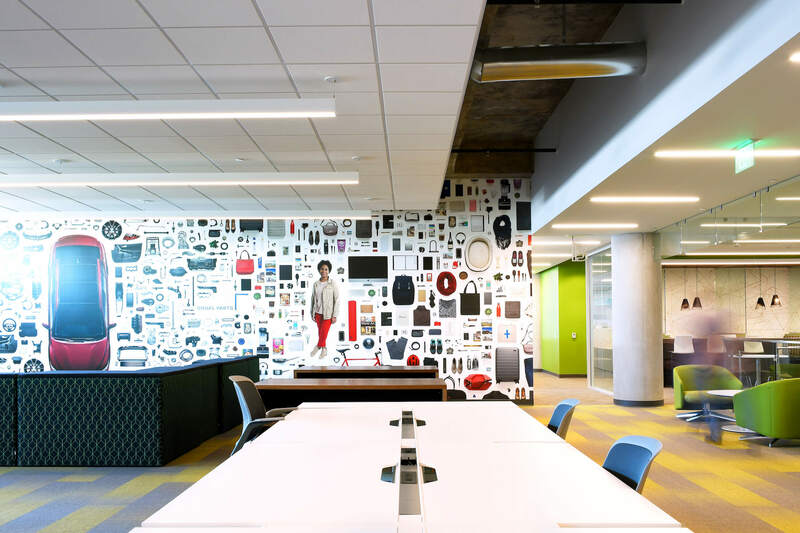 Over 90 percent of occupied office spaces have spatial punctuations of daylight and views directly to the outdoors. Large lightwells (approximately 4,000 sq. feet) are strategically placed throughout the buildings. These lightwells penetrate through floors and provide more employees access to daylight, which has been shown to increase productivity. 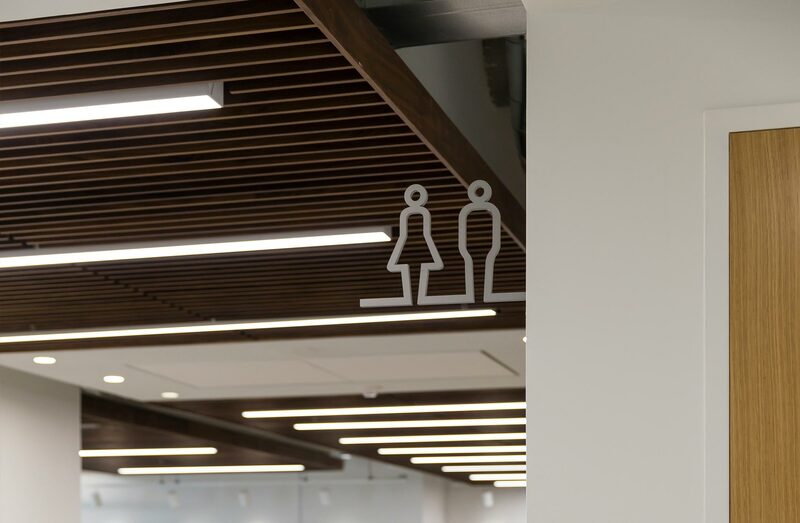 Intuitive wayfinding mechanisms found on the floor, in the ceiling and in the art and branding displays lead one throughout the space seamlessly. Journeying through the space, one cannot ignore how effortless, and enjoyable, getting from A to B…or to C or D really is. 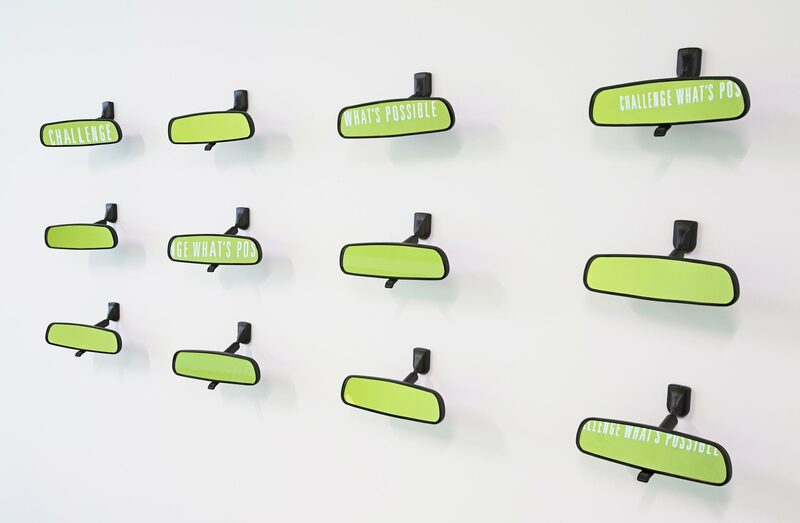 Every room, location and desk throughout the entire campus is labeled according to a simple and straightforward naming system that make it easy to find your way. 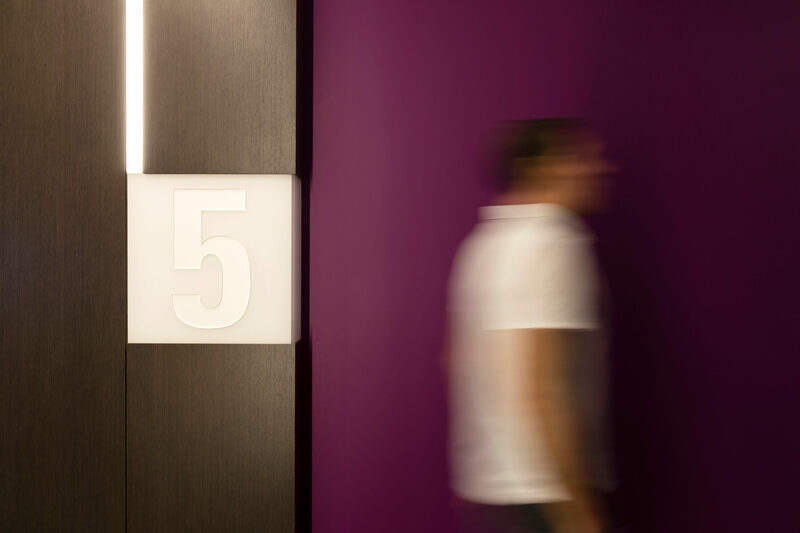 Conference rooms can be found through a simple numbering system. 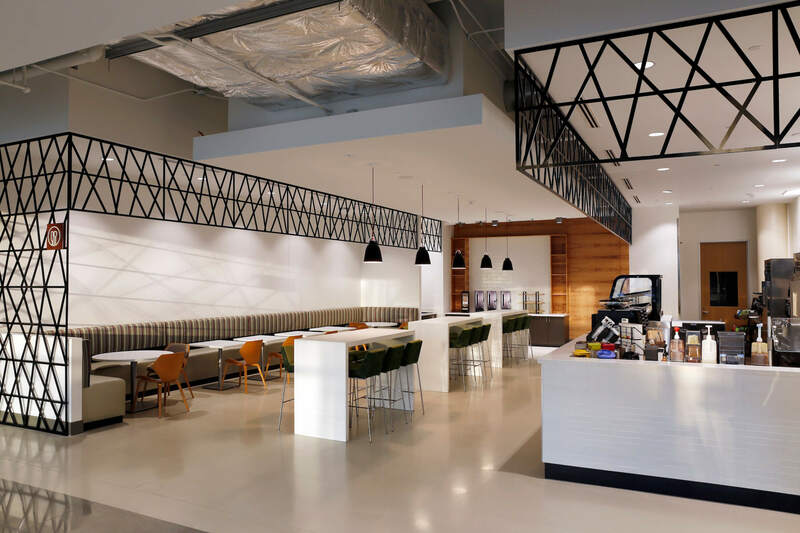 Whether from a café, the courtyard, concourse or one of the many common areas, Toyota Team Members are welcomed and empowered to “Design your day” and work from anywhere at any time. This incredible amount of flexibility, connectivity and choice is powered by the Wi-Fi-blanketed, technology-rich campus. The ease and flexibility to work anywhere is also enjoyed by visitors and business partners, who can easily connect anywhere indoors or outdoors. If these buildings could talk, they’d have a lot to say. Many companies espouse the values of their culture, their people and their perks. But a brief walk through Toyota’s headquarters really says it all. “You can’t walk in here and not feel the value that Toyota places on its Team Members. It’s just not possible,” says Corgan interiors leader Lindsay Wilson. Toyota’s tremendous care and respect for its Team Members inspired our team’s focus on the everyday experience of working in the space. The Toyota headquarters feels first and foremost like a place of learning and discovery instead of the typical corporate headquarters. At the forefront, are the Company’s newest vehicles and inventions instead of cubicles and conference rooms. Within the first few feet of stepping on campus, one immediately feels and can embrace the personality of Toyota. 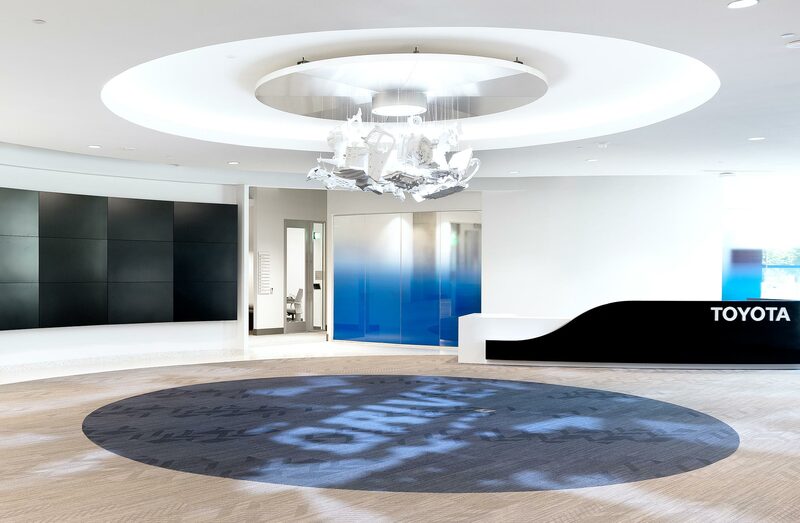 Upon entering, a light and spacious lobby features the company’s latest vehicles and futuristic concept cars on display, visually connecting Team Members to the end result of their efforts. The space’s layout around a central courtyard reminds many of a bustling university campus. Moving further throughout the campus, one naturally happens upon cafes, lounge areas, meeting rooms and dining spaces featuring natural light and greenery. This area is called the “Amenities Loop,” and features a number of different zones that include dining options, a fitness area, a bank and credit union, conference centers and work environments. The spaces between these areas are peaceful and serene, and all of the amenities are unique and thoughtfully located to avoid the feeling of uniformity or mass production. The amenities that line the outside of the central courtyard carefully incorporate “spaces between the spaces” - general impromptu areas that tie everything together and create an energy that is carried to the upstairs offices. 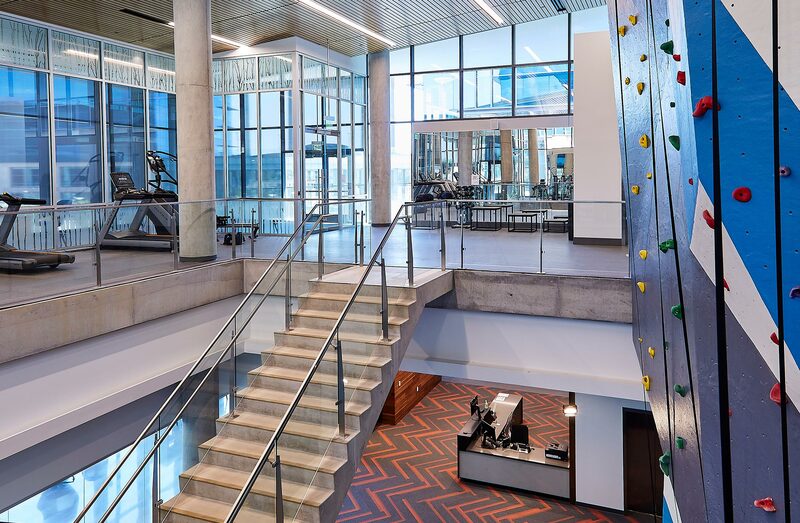 Campus amenities include a fitness center, a healthcare center and pharmacy, credit union, convenience store, cafe, training center, and more. Spaces lining the Central Courtyard include ample areas for casual meetings or additional workspaces exposed to natural light. 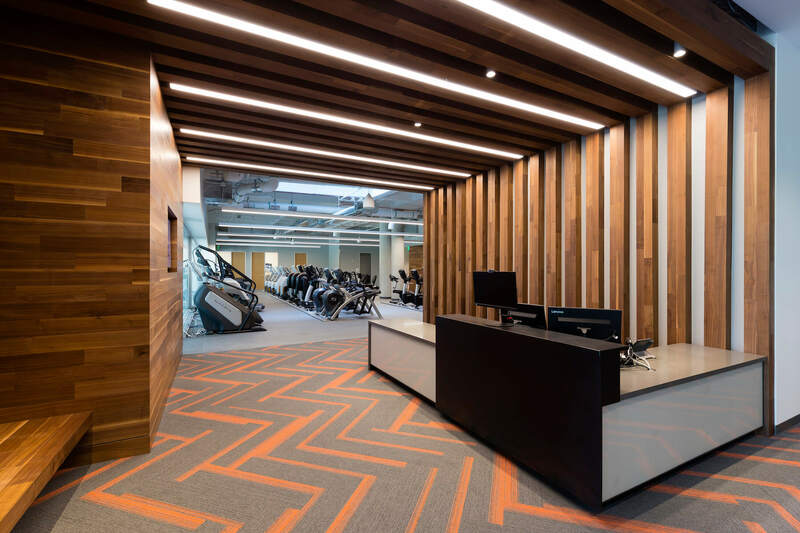 Amenities such as the on-site fitness center provide employees flexibility and encourage a work/life integration as part of the culture. There are almost a dozen different dining options with ample seating. State of the art conference and training rooms provide spaces for group meetings and collaboration. 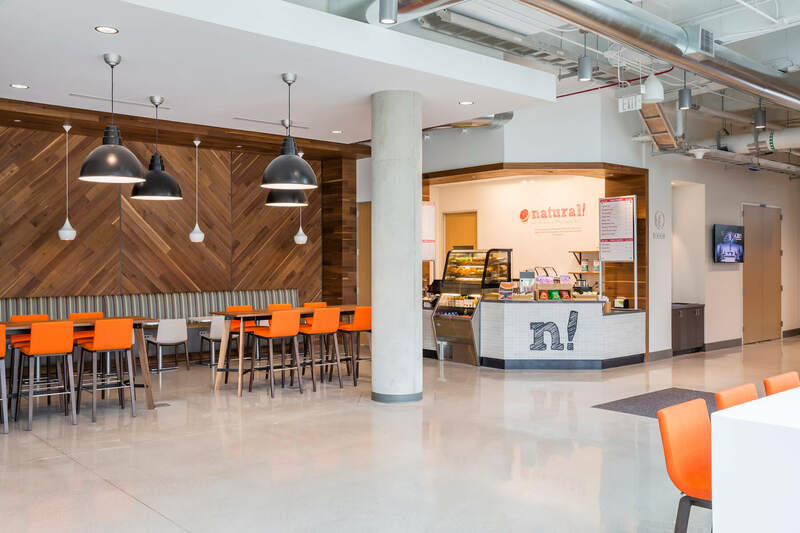 The wide-range of dining options also give the feel of a college commons. Smaller, dedicated dining areas allow for meetings during the lunch hour. Specialty dining options are spaced throughout the amenities loop and provide variety outside of the already expansive cafeteria. 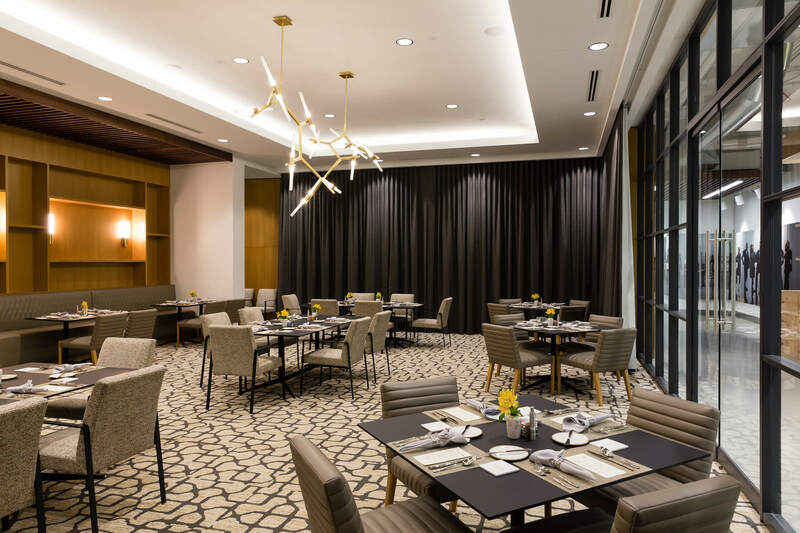 Casual dining spaces allow employees and visitors a variety of options during meal times. Small surprises are purposefully placed around every corner, allowing for pleasant discoveries constantly throughout the day. The campus has a hidden “off stage” area, similar to something that a hotel or theme park would have, where all of the operational aspects related to maintaining the building are done out of sight. The sophisticated back-of-house system also allows for the entire space to be home to a beautiful, convenient, tailored experience. The Knowledge Center serves as a destination for training on-campus and includes a variety of meeting rooms, breakout spaces and a pavilion used for large events or conferences. 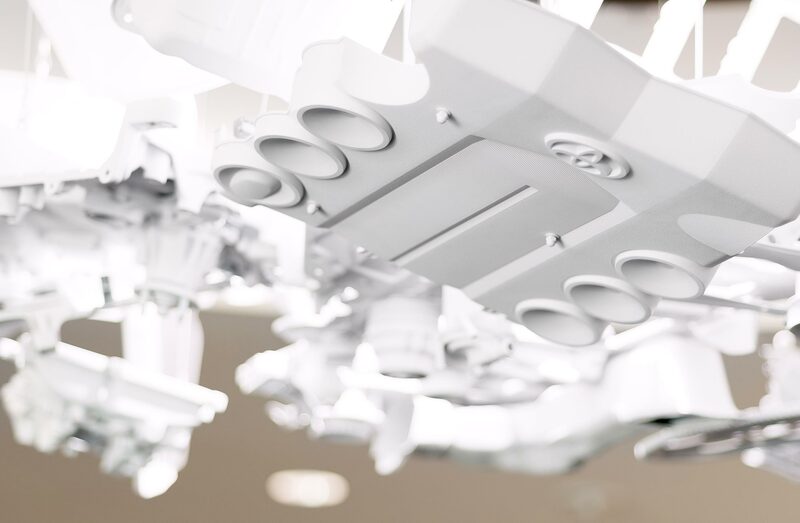 A sculpture hangs from the ceiling in the Knowledge Center made from parts of a Toyota vehicle. 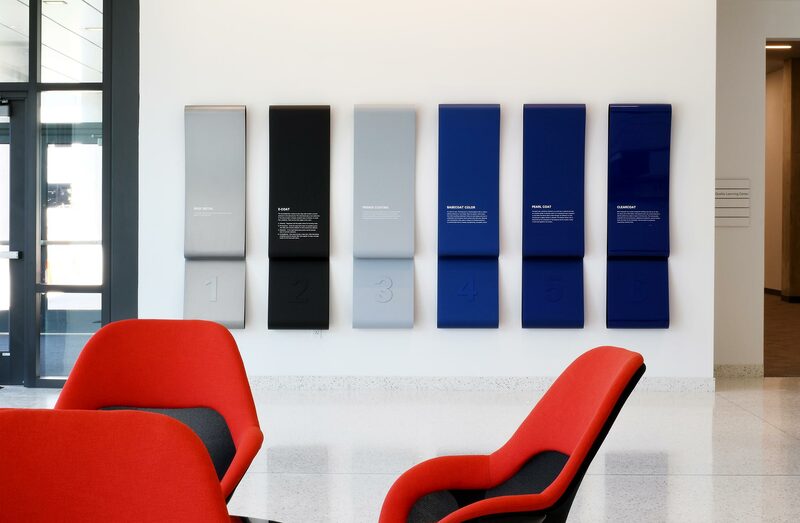 The work spaces are adorned with fun visual elements such as the wall seen here displaying Toyota paint colors. 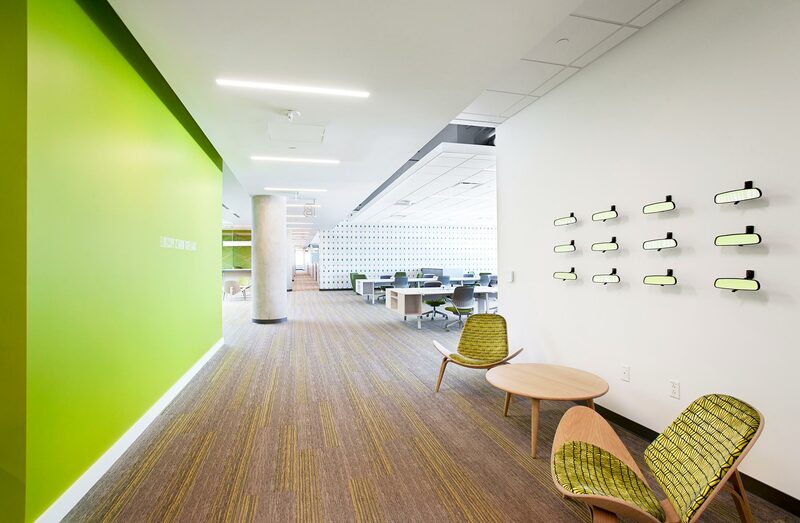 The campus features a workplace layout that is 50% open and collaborative. 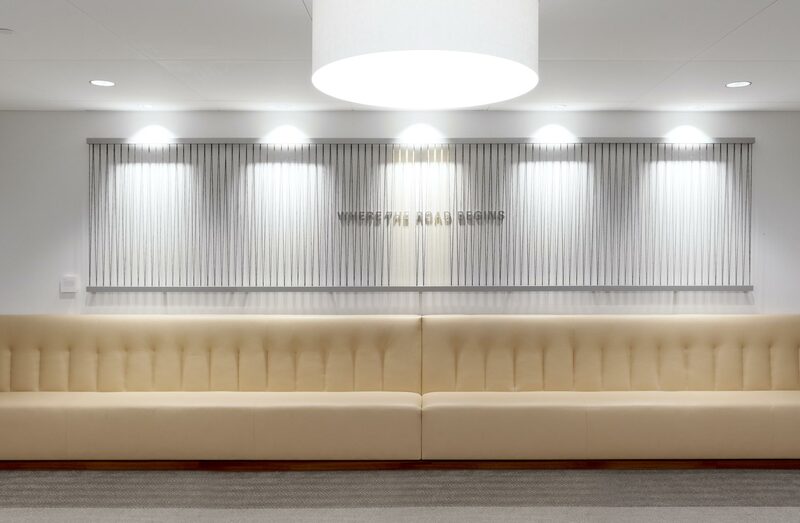 Art installations are found in each of the seven office buildings; each one a subtle reminder of the principals One Toyota is founded on. 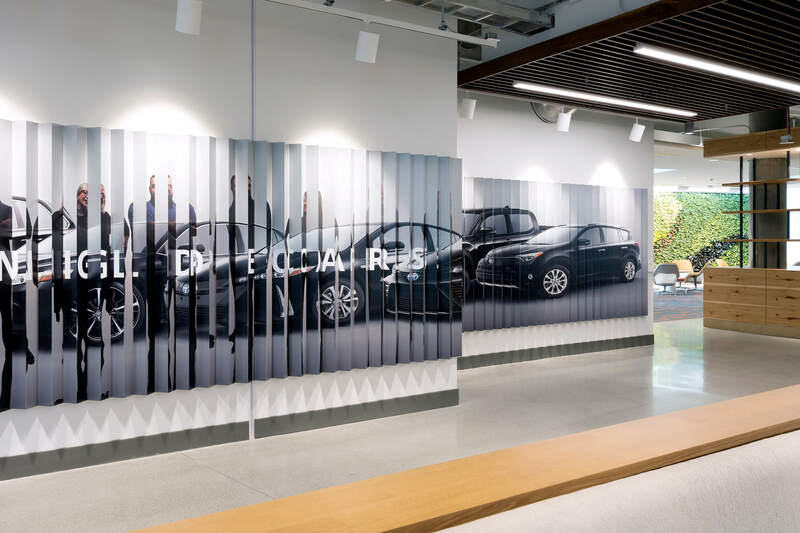 Throughout the campus, design elements were integrated to advance Toyota’s goals for unity and connectedness within their organization as part of the One Toyota vision. 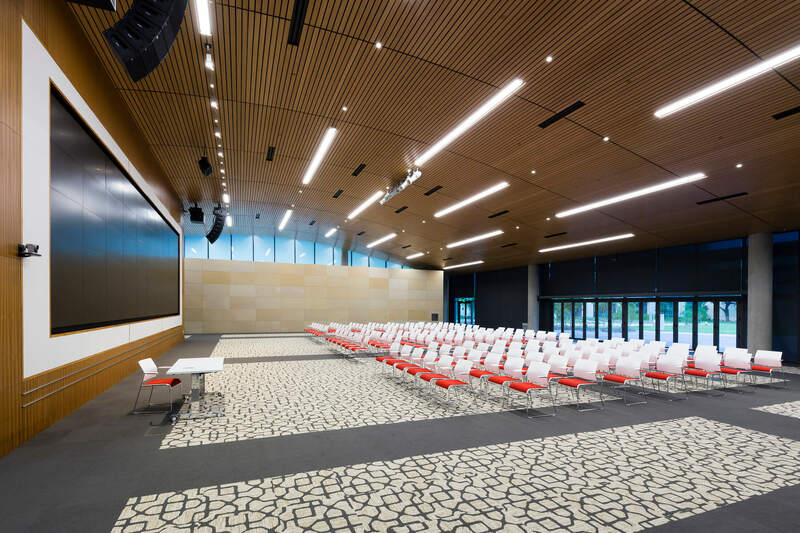 Bringing together 19 different corporate functions under one roof not only challenged the status quo but it also called for designing a new space to call home.